(Trent Nelson | The Salt Lake Tribune) Utah Jazz guard Ricky Rubio (3). Utah Jazz vs Memphis Grizzlies, NBA basketball in Salt Lake City on Friday Nov. 2, 2018. 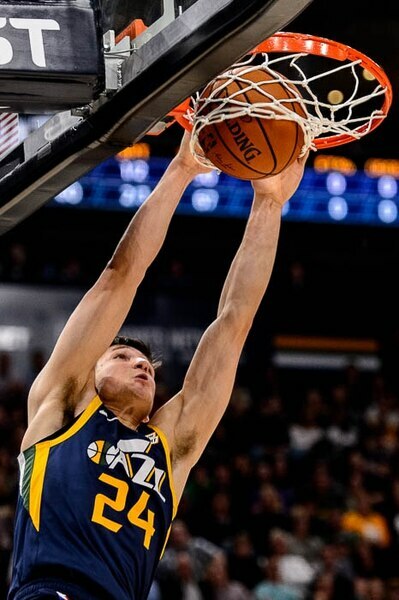 (Trent Nelson | The Salt Lake Tribune) Utah Jazz guard Grayson Allen (24) dunks. Utah Jazz vs Memphis Grizzlies, NBA basketball in Salt Lake City on Friday Nov. 2, 2018. 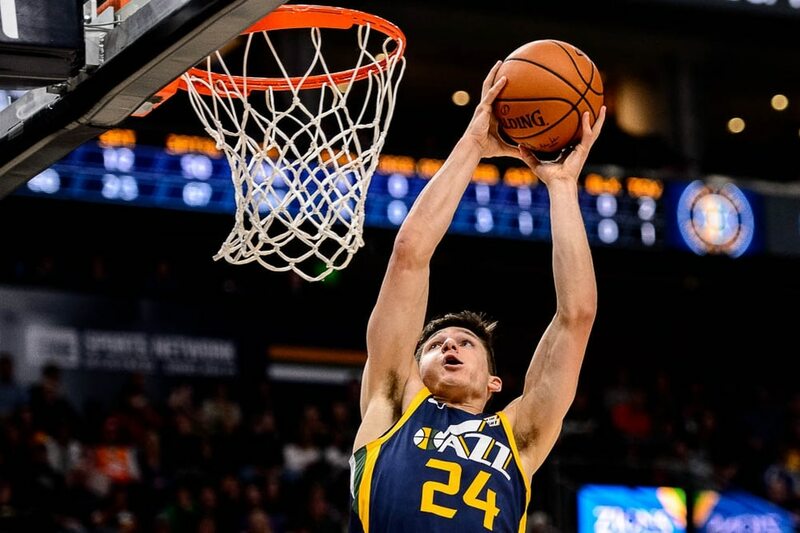 (Trent Nelson | The Salt Lake Tribune) Utah Jazz guard Grayson Allen (24) dunks. Utah Jazz vs Memphis Grizzlies, NBA basketball in Salt Lake City on Friday Nov. 2, 2018. (Trent Nelson | The Salt Lake Tribune) Utah Jazz forward Joe Ingles (2) drives on Memphis Grizzlies guard Dillon Brooks (24). Utah Jazz vs Memphis Grizzlies, NBA basketball in Salt Lake City on Friday Nov. 2, 2018. (Trent Nelson | The Salt Lake Tribune) Utah Jazz forward Derrick Favors (15) defended by Memphis Grizzlies center Marc Gasol (33). Utah Jazz vs Memphis Grizzlies, NBA basketball in Salt Lake City on Friday Nov. 2, 2018. (Trent Nelson | The Salt Lake Tribune) Utah Jazz forward Derrick Favors (15). Utah Jazz vs Memphis Grizzlies, NBA basketball in Salt Lake City on Friday Nov. 2, 2018. (Trent Nelson | The Salt Lake Tribune) Utah Jazz forward Derrick Favors (15). Utah Jazz vs Memphis Grizzlies, NBA basketball in Salt Lake City on Friday Nov. 2, 2018. (Trent Nelson | The Salt Lake Tribune) Memphis Grizzlies guard Shelvin Mack (6) and Utah Jazz guard Dante Exum (11). Utah Jazz vs Memphis Grizzlies, NBA basketball in Salt Lake City on Friday Nov. 2, 2018. (Trent Nelson | The Salt Lake Tribune) Utah Jazz forward Royce O'Neale (23). Utah Jazz vs Memphis Grizzlies, NBA basketball in Salt Lake City on Friday Nov. 2, 2018. (Trent Nelson | The Salt Lake Tribune) Utah Jazz forward Royce O'Neale (23). Utah Jazz vs Memphis Grizzlies, NBA basketball in Salt Lake City on Friday Nov. 2, 2018. (Trent Nelson | The Salt Lake Tribune) Utah Jazz forward Jae Crowder (99) is fouled by Memphis Grizzlies forward Ivan Rabb (10). Utah Jazz vs Memphis Grizzlies, NBA basketball in Salt Lake City on Friday Nov. 2, 2018. (Trent Nelson | The Salt Lake Tribune) Utah Jazz guard Dante Exum (11). 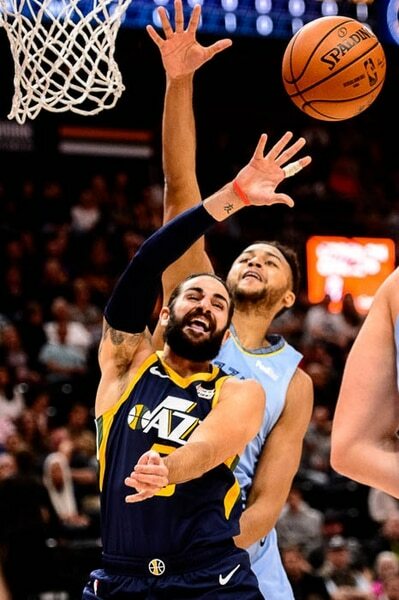 Utah Jazz vs Memphis Grizzlies, NBA basketball in Salt Lake City on Friday Nov. 2, 2018. (Trent Nelson | The Salt Lake Tribune) Utah Jazz center Rudy Gobert (27). Utah Jazz vs Memphis Grizzlies, NBA basketball in Salt Lake City on Friday Nov. 2, 2018. (Trent Nelson | The Salt Lake Tribune) Utah Jazz center Rudy Gobert (27). Utah Jazz vs Memphis Grizzlies, NBA basketball in Salt Lake City on Friday Nov. 2, 2018. (Trent Nelson | The Salt Lake Tribune) Utah Jazz guard Dante Exum (11) on the bench in the final minute. Utah Jazz vs Memphis Grizzlies, NBA basketball in Salt Lake City on Friday Nov. 2, 2018. (Trent Nelson | The Salt Lake Tribune) Utah Jazz guard Dante Exum (11) defended by Memphis Grizzlies guard Dillon Brooks (24). Utah Jazz vs Memphis Grizzlies, NBA basketball in Salt Lake City on Friday Nov. 2, 2018. (Trent Nelson | The Salt Lake Tribune) Utah Jazz forward Joe Ingles (2) protests a delay of game call. Utah Jazz vs Memphis Grizzlies, NBA basketball in Salt Lake City on Friday Nov. 2, 2018. (Trent Nelson | The Salt Lake Tribune) Utah Jazz forward Joe Ingles (2) is double-teamed by Memphis Grizzlies forward Kyle Anderson (1) and Memphis Grizzlies center Marc Gasol (33). Utah Jazz vs Memphis Grizzlies, NBA basketball in Salt Lake City on Friday Nov. 2, 2018. (Trent Nelson | The Salt Lake Tribune) Utah Jazz center Rudy Gobert (27) prepares to slam the ball into the standard. Utah Jazz vs Memphis Grizzlies, NBA basketball in Salt Lake City on Friday Nov. 2, 2018. (Trent Nelson | The Salt Lake Tribune) Utah Jazz guard Ricky Rubio (3). Utah Jazz vs Memphis Grizzlies, NBA basketball in Salt Lake City on Friday Nov. 2, 2018. Call it the Return of the Mack. In another excellent game against the Jazz since leaving Utah, Memphis point guard Shelvin Mack scored 19 points on Friday night, hitting the game’s most important shots and leading the Grizzlies to a 110-100 win over the Jazz at Vivint Smart Home Arena, their second such win in as many weeks. Mack wasn’t alone, of course. Memphis’ tandem of Mike Conley and Marc Gasol, now in their 11th season together, was again fantastic. Conley led all scorers with 28 points, adding five rebounds and five assists, while Gasol had 17 points, 10 rebounds, and seven assists to go along with some tremendous defense. But it was Mack, the former Jazzman who played 83 games in parts of two seasons with Utah, who hit the game’s go-ahead shots. Mack hit seven of his 11 shots, including four of his six 3s, to turn the tide at the end of the third and beginning of the fourth quarter. That the problem was the defense, not the offense for the Jazz (4-4) was a surprise after the offensive struggles on Oct. 22, when the Jazz scored only 84 against this Grizzlies team at home. That was especially true with Donovan Mitchell missing the game due to right hamstring tightness — while an MRI performed Thursday came back negative for any tears, the Jazz thought it best to sit Mitchell for at least a game. Rookie Grayson Allen got his first NBA start, as Jazz coach Quin Snyder tried to insert an offensive threat at the shooting guard position. Allen didn’t do a lot with the opportunity, though, and finished with nine points, just one assist, and a game-low plus-minus of -18. On the other hand, Mitchell’s usual perimeter mates did come through. Ricky Rubio was the Jazz’s best offensive player, scoring 22 points and finding his teammates well in Memphis’ packed defense. Rubio’s 11 assists marked the third time he’s had double-digits in that statistic through eight games, something he only did seven times total last season. The whole game was classic Jazz vs. Grizzlies action: slow, gritty, physical, and featuring a lot of trips to the free-throw line. The zebras called 54 fouls overall on Friday, which sent Memphis to the line 34 times. It was also a lengthy contest, lasting 2 hours and 21 minutes despite the outcome not being particularly in doubt at the end. But on the defensive end, the Jazz lacked any bite. Gobert struggled throughout, allowing an uncharacteristic number of baskets inside and out as he struggled to track the all-court threat of Gasol. And thanks to finishing with just nine points, Gobert missed out on a double-double for the first time this season, though he did find 16 rebounds. Gobert wasn’t the only one responsible for the defensive effort, though. Down to a man, the team noted that as a collective unit, the Jazz didn’t bring the competitiveness to lock down the Memphis Grizzlies, just as they didn’t have enough against the Minnesota Timberwolves in a loss on Wednesday. The Jazz rank just 14th defensively after leading the league in 2017-18. “They put it us in situations where we need to communicate more and have the collective mindset to play harder and smarter,” Snyder said. The defense hasn’t been the only surprise for the Jazz so far this year. In three games, the Jazz are winless at home, while accumulating a 4-1 record on the road. While a team might usually hate the idea of a back-to-back in Denver, the Jazz’s away record and an opportunity to turn the tide defensively give the Jazz some hope against the Nuggets on Saturday night. “We just need to be better," Jazz point guard Dante Exum said.